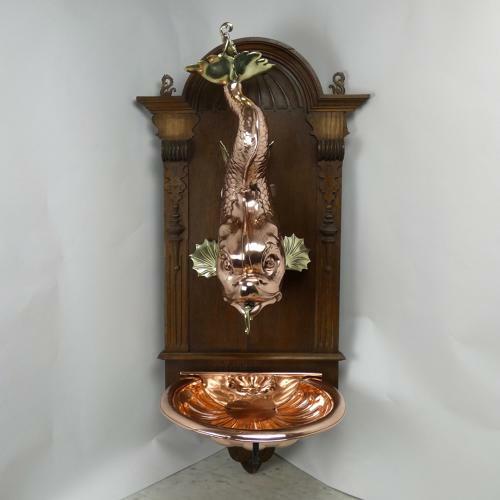 An exceptional French copper water feature. This would have been made as an interior feature, for washing in, and it dates from c.1890. The water container is in the shape of a sturgeon. This was the royal fish. It is often confused with a dolphin as the shape is the same but the sturgeon has scales whereas the dolphin doesn’t. The sturgeon is finely modelled, in copper, with the tail and fins being cast in brass. The sturgeon would have been filled with water and there is a brass tap coming out of the fishes mouth. The water then pours from the underside of the fishes chin into the copper bowl beneath. The bowl is shell shaped, as is the small copper soap dish which sits into the top of the bowl. All of this is mounted onto a nicely shaped, oak backboard. There are a couple of minor loses to this oak backboard but otherwise the piece is in very good condition and it is still functional. Price includes postage with the U.K. and Western Europe. Shipping to the U.S.A. add £50.